The main business of the night was of course the music and there were wins in three major categories for The 1975, Emeli Sandé and Drake at this year’s awards. 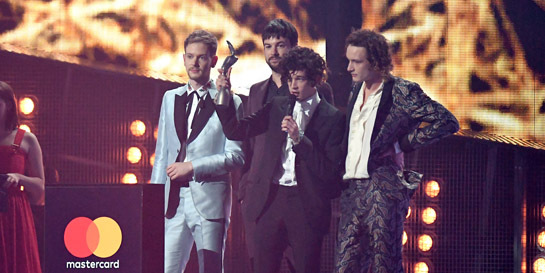 The 1975 and Emeli both delivered spectacular performances to accompany their wins, alongside Katy Perry and Skip Marley’s headline-grabbing version of new single Chained To The Rhythm. ITV viewing figures peaked at 6.3m for her performance. The 1975 capped off an incredible 12 months by scooping the British Group award, almost exactly a year to the day after the release of their number one Dirty Hit/Polydor album, I Like It When You Sleep, For You Are So Beautiful Yet So Unaware Of It. Sales of the album surged following their performance at the music industry’s big night at London’s O2 Arena. Emeli Sandé, who released her second Virgin EMI album Long Live The Angels last year, won in the British Female Solo Artist category. It is her third BRIT, following 2013's Album or the Year and British Female Solo Artist double for debut release, Our Version of Events. Drake, who makes no secret of his love for the UK and whose music is released here by Island Records, was named International Male Solo Artist in recognition of his album, Views, and the phenomenal global hit, One Dance.